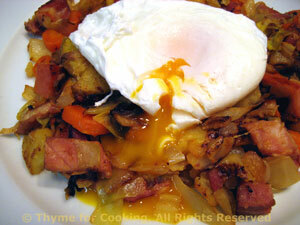 Ham Hash with Poached Egg, Thyme for Cooking easy skillet dinner. Cut all other vegetables into small pieces, about 1/3" (1cm) cubes or slices. Cut beef or ham the same. Add everything else and let fry, undisturbed, for about 5 minutes.